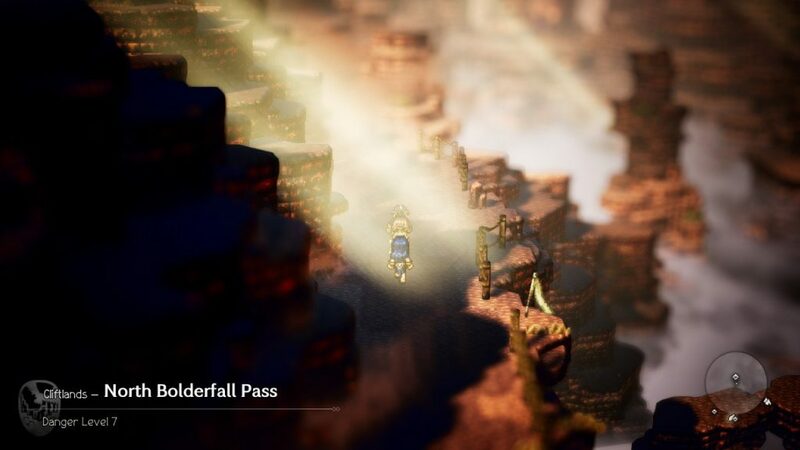 Octopath Traveler is finally out on Nintendo Switch and we’ve been playing it over the last week. 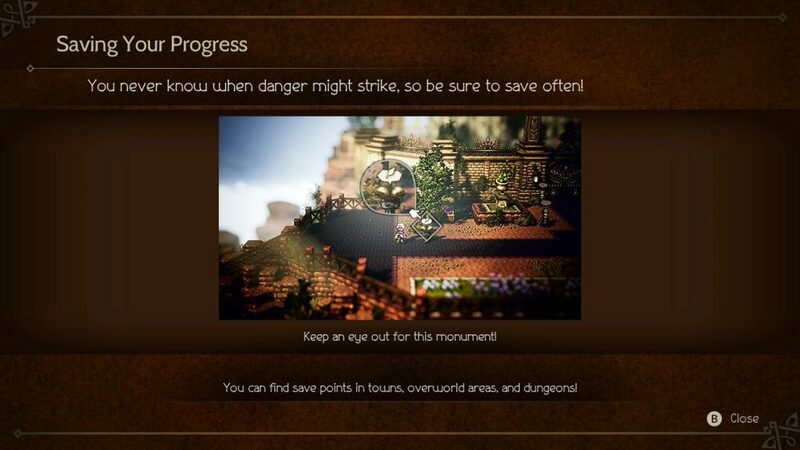 Eager fans have already sampled the game through both demos but now that the final game is available, here are some tips to help you get started on the right foot as you journey through Orsterra. While you can start as whoever you want out of the 8 characters, this decision is very important. The character you start with is basically the protagonist of the story and will be locked into your party. Make sure you pick a class (character) you’re familiar with or one that you want to use in your party permanently here. I’ve already had someone else get stuck with a class they don’t want to use while playing and the only option is to restart. Olberic is a good and safe choice as a tank and one with simple skills initially. This applies to most games but I recommend saving often here because I’ve run into some super hard enemies early on that can wipe your party out if you don’t pay attention. 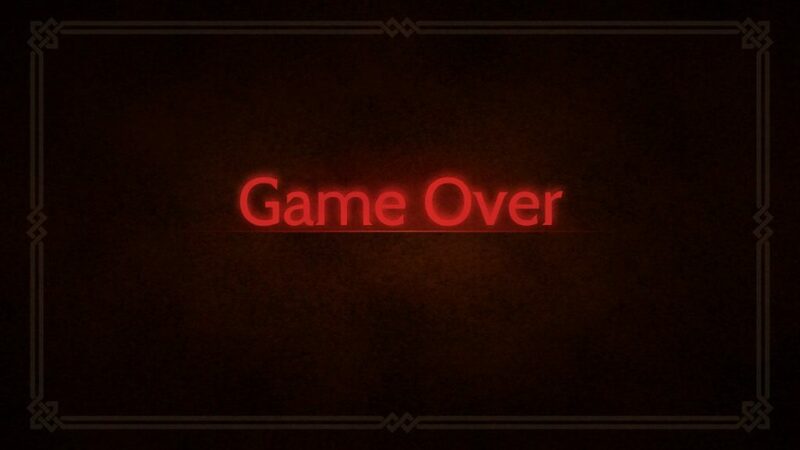 The game autosaves but you’re better off saving at every save point (they are plentiful) when you can. Since the Switch is a handheld as well, I was hoping for a save anywhere, but you literally won’t be walking more than 5 or 10 minutes without a save point so make use of them. Healing items are cheap and you will have loads as you work your way through the intro chapters for each character. I know many JRPG players (including myself) enjoy hoarding items and end up finishing games with a ton of unused stuff (Mega Elixirs in Final Fantasy anyone?) but some enemies hit quite hard early on so don’t be afraid to heal up when needed. There’s no shortage of grapes. 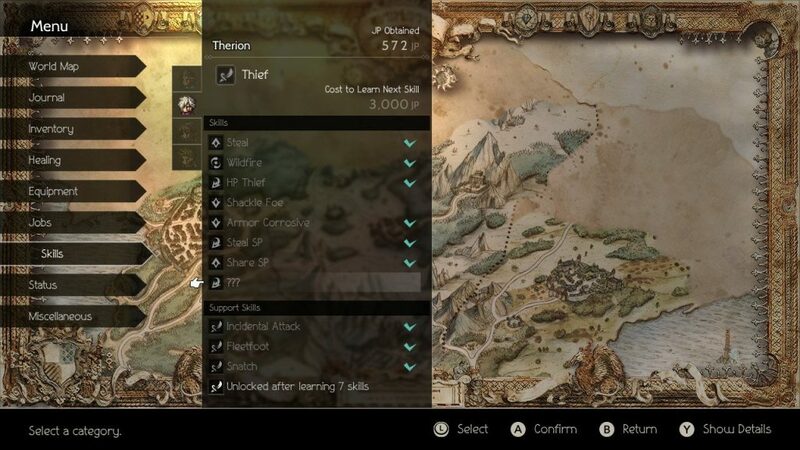 Path actions are super useful depending on your character to get items free, get discounts, learn information, gain experience, and more. While a few of them are similar, they are really useful regardless. As you play through the opening for different characters, use the fast travel and visit older towns and use your new path actions. These will help you with side quests as well as just to gain better equipment and items for free in many cases. As you exit towns or enter new areas, there’s always a “danger level” mentioned before you move to the next area. Pay attention to this as you need to make sure the level isn’t too much higher above your current level (average party level) because you will have a bad time. The world is full of optional dungeons and many are super hard early on. You earn Job Points that let you unlock skills for your current and your equipped jobs. Each character has a main Job and a secondary one. Long gameplay sessions can have you gaining a ton of JP and you best be using these soon because the active skills are useful and the passive ones you unlock after a few active skills can be beyond helpful. You can unlock any active skill first but the cost to unlock more increases very quickly with each new skill. Keep this in mind when making your decisions for which skills to unlock and don’t be afraid to save scum to try out skills. 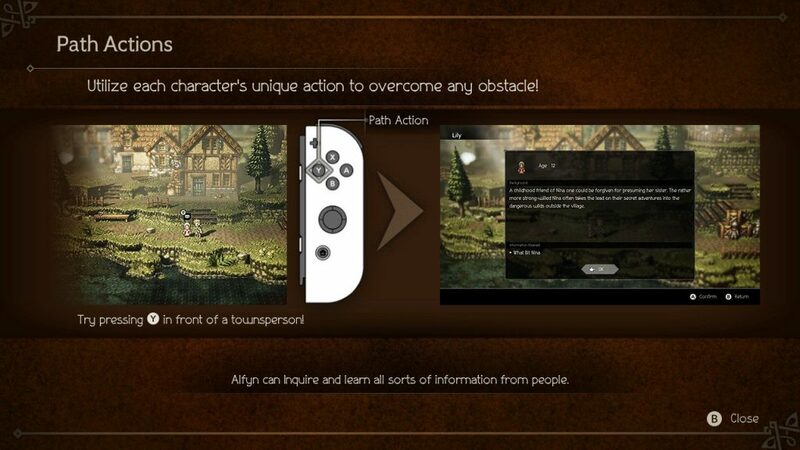 You can use 4 characters at a time in the party and out of those, one is fixed at all times as your first character and there usually is a second fixed depending on the story chapter. Before setting out into a dungeon or exploring, make sure to spend time in the Inn to unequip items from party members you are not going to be using so you don’t have equipment locked to them until you reach an Inn somewhere else. 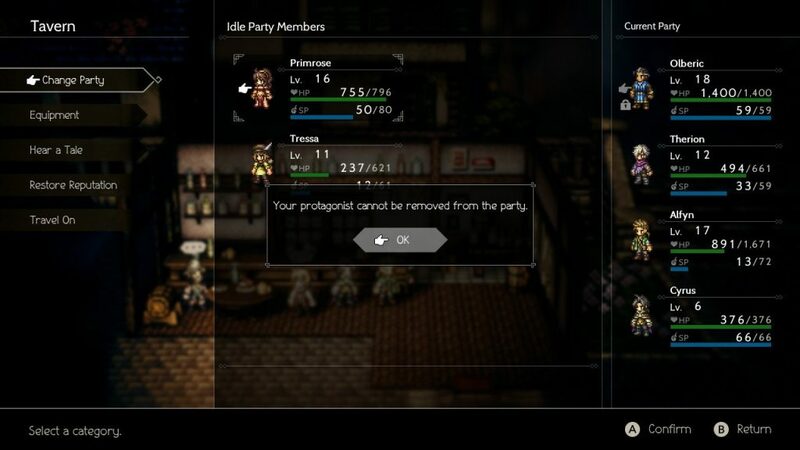 You can only remove equipment from members while they are in the party during exploration so keep that in mind. 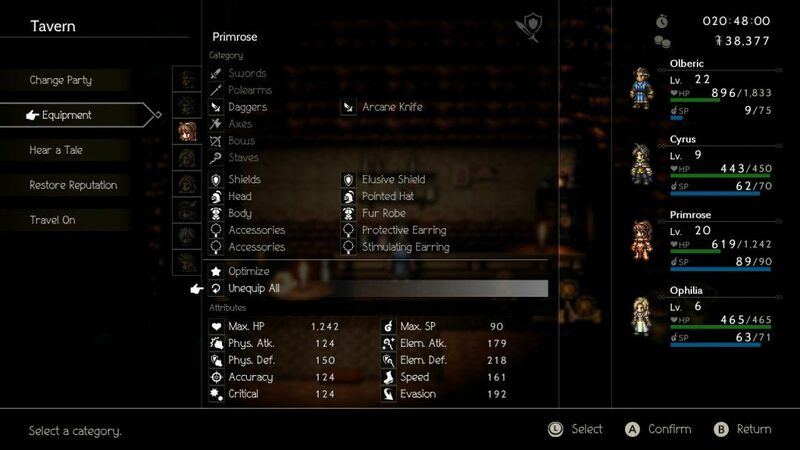 Octopath has optimise and unequip all options in the equipment menu so use them. 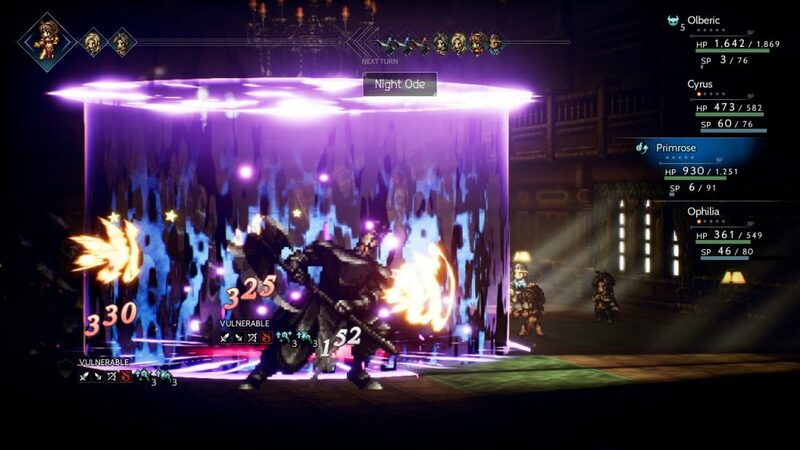 Hopefully these tips help you out in Octopath Traveler because this game is super meaty but things can get dicey pretty quickly if you aren’t careful.